Welcome to our Ischia blog, Good Morning Ischia! Here you can see the entry for Friday 13th December 2013. It's another beautiful morning in Forio on the west coast of Ischia, the sun is up, the skies are clear and the sea is a picture of calm. There have been a few uncharacteristic sounds outside as a distant helicopter made its way past the island, followed a little bit later on by some fireworks. I'm still scratching my head to understand why somebody would let off fireworks first thing in the morning when nobody can see them but I'm sure there's a perfectly reasonable explanation! Temperatures are unexpectedly warm again today with a maximum of 17° Celcius (62° fahrenheit) and a minimum of 12°C (53°F) expected. So while the weather outlook remains very positive, we must all turn our attention briefly to the scary fact that today is Friday the 13th. Oh what to do, is it best to stay indoors with all of the doors and windows bolted or should we try and just brave the day out and hope that nothing too bad happens? To many people today will pass just like any other, but there are many millions of people the world over gripped in varying degrees of "friggatriskaidekaphobia" (the fear of Friday the 13th), and Italy is no stranger to such fears or superstitions. We know that the number thirteen is considered unlucky and there are at least 13 theories as to why this may be. Some people say that thirteen is unlucky because it's one more than twelve which is seen as divine, as evidenced by its use in calendars, the signs of the zodiac, clocks and months etc, while others that say it's because there were thirteen people present at the last supper. Although in modern times Italians share the fear of Friday the 13th, it is more traditional and commonplace for them to regard Friday the 17th with even more dread. The number 17 when written in Roman numerals is "XVII", but those numerals can easily be rearranged to spell the word "VIXI" which in Latin means "I have lived" or "I lived", signifying "life is over". The number is so greatly feared that you're unlikely to ever stay in a room number seventeen in an Italian hotel, sit at a table number seventeen in an Italian restaurant, find yourself on the seventeenth floor of an Italian building or god forbid sit in seat number 17 on an Italian aeroplane! Italian superstitions are well documented and follow many of the same traditions in English-speaking countries such as avoiding walking under ladders or being crossed by a black cat, but nowhere is superstition felt more acutely than in the city of Naples. Today's photo comes from the Fontanelle Cemetery in the Materdei district of Naples, a huge ossuary with thousands of skulls and bones where the bodies of plague victims were placed since the 1500's. After hundreds of years of neglect, the cemetery was cleared up and renovated before finally being opened to the public in 2006. 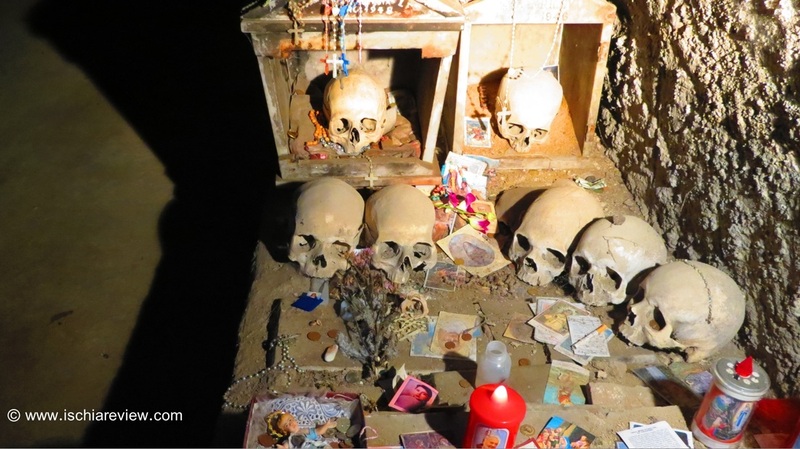 Now that it's open to visitors, Il Cimitero delle Fontanelle is a hotbed of superstition. The belief is that by placing an item of value on one of the skulls you will be rewarded with good luck. As you can see from the photo above, people leave coins, flowers, photos and even bus tickets next to the skulls in the hope that some good fortune will come their way. The people that leave these gifts could be suffering from an illness or have difficulty with infertility and they hope that by passing on something of value to these lost souls that they might in some way be cured. Others who are more fiscally-minded hope for a financial windfall or in many cases the lottery numbers to somehow appear to them as a sign! The Fontanelle cemetery is a fascinating place to visit and can be reached from Ischia very easily as part of a day-trip to Naples. For anybody who would like more information on how to get there please let us know and we'll be happy to advise. Ok that's all from me today, I wish you all the very best of luck and a day that passes without dramatic incident!